Brandie Kajino uses humor & eye-blinding enthusiasm to connect, teach & guide others. She can be found trying new recipes, lusting after copper cookware, frolicking through farmers markets and sipping hot beverages at a local coffee shop. She writes about her fab finds, (mostly) plant-based simple recipes and “it’s easier than you think” tips on her site, Spoon And Saucer. You can also find her on Twitter and Pinterest. 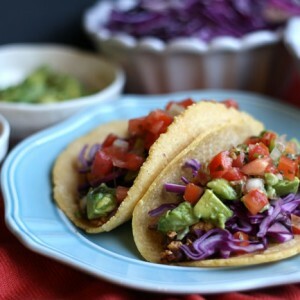 Start with something easy like this plant-based taco. If you’re in the “Taco Tuesday” crowd, this one is easy to roll into your week. My son, who is 12, has asked for this “taco tofu” specifically because he loved it so much. Um, WIN.